W. Brooks Gentry, M.D., was named the inaugural recipient of the Carmelita S. Pablo Endowed Chair in Anesthesiology. From left to right, back row, are UAMS Chancellor Dan Rahn, M.D., UAMS College of Medicine Dean Pope Moseley, M.D., and Carmelita S. Pablo, M.D. 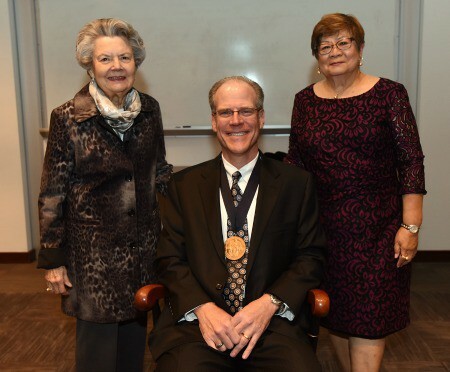 Dec. 7, 2016 | Dec. 7, 2016 | W. Brooks Gentry, M.D., chair of the Department of Anesthesiology in the College of Medicine at the University of Arkansas for Medical Sciences (UAMS), was invested Dec. 6 as the inaugural holder of the Carmelita S. Pablo, M.D., Endowed Chair in Anesthesiology. Gentry has been at UAMS for two decades as a professor in the Department of Anesthesiology and the Department of Pharmacology and Toxicology. He succeeded Pablo as department chair upon her retirement in 2014. A legacy of three: Gentry, chair of the Department of Anesthesiology, is flanked by past chairs Dola S. Thompson, M.D., and Pablo. The Carmelita S. Pablo, M.D. 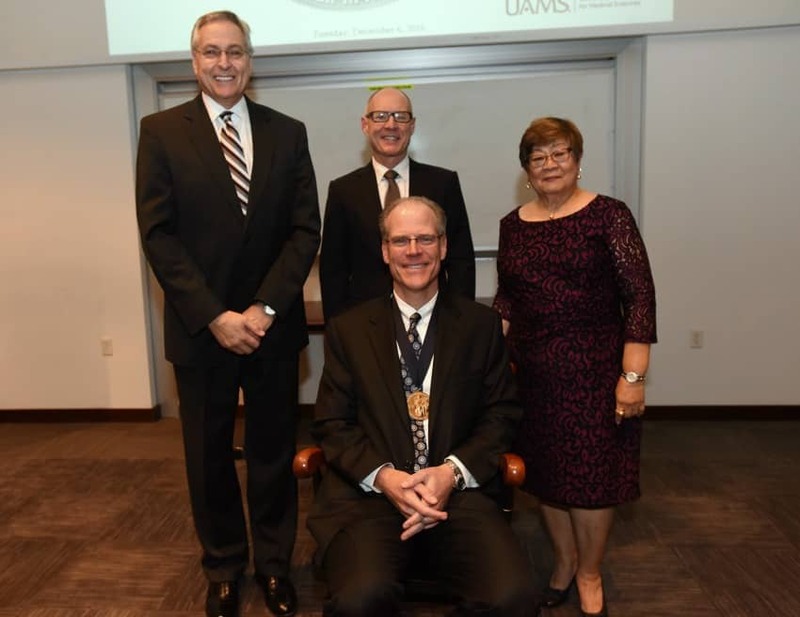 Endowed Chair in Anesthesiology recognizes Pablo’s 33-year career and commitment to providing education and training for residents, as well as consistent, steady service to UAMS and its patients. Beginning in fall 2011, over a period of 10 months, UAMS anesthesiologists raised $634,000 toward the creation of the chair. The remaining funds were contributed by multiple donors in honor of Pablo. Pablo joined UAMS in 1981, serving as chair of the Department of Anesthesiology from 2002 until her retirement. She served as interim chair of the department in 2001, and was an associate professor in the Department of Orthopaedic Surgery in the College of Medicine. She taught more than 1,000 residents during her 31 years at UAMS. Pablo received her medical degree in 1968 from the University of Santo Tomas. At Temple University Hospital in Philadelphia, she completed her residency, followed by an anesthesiology fellowship at UAMS. At UAMS, Pablo was chosen by students to receive the Red Sash Award three times for excellence in teaching as well as the Golden Apple Award as outstanding faculty of the year. She was nominated by colleagues for the Outstanding Woman Faculty Award multiple times and received the honor in 2014. She has been included in the list of Arkansas’ Best Doctors as named by Best Doctors Inc.
Other speakers at the ceremony included Pope Moseley, M.D., UAMS executive vice chancellor and dean of the College of Medicine; Michael J. Avram, Ph.D., associate professor of anesthesiology at the Northwestern University Feinberg School of Medicine; and S. Michael Owens, Ph.D., professor in the Department of Pharmacology and Toxicology in the UAMS College of Medicine. Rahn and Moseley presented Gentry with a commemorative medallion. Gentry thanked those in the Department of Anesthesiology for their support, citing an atmosphere that allows for both personal and professional growth. Gentry joined the UAMS faculty in 1994. He received his bachelor’s degree in biology from Hendrix College in 1984. He came to UAMS for his medical degree, graduating in 1988, and then trained in anesthesiology at Northwestern University in Chicago. There he served as chief resident and completed a fellowship in clinical pharmacology and pharmacokinetics under Dr. Michael Avram’s guidance, along with Drs. Thomas Henthorn and Tom Krejcie. He has clinical interests in ambulatory and trauma anesthesiology. Since 1996, Gentry has partnered with Owens on research into the development of therapies for drug addiction. Their collaboration and work led to the formation of InterveXion Therapeutics LLC, a UAMS BioVentures company that works to develop antibody and vaccine medications, with Gentry serving as chief medical officer. He headed the first clinical trial of antibody medication to treat methamphetamine addiction. Owens taught medical students at UAMS when Gentry was a medical student, but didn’t meet him until Gentry approached him at a national conference, asking to work together. “I came back and looked at his qualifications and thought, oh my goodness, this is really somebody special,” Owens said. Before his appointment as chair of the Department of Anesthesiology in 2014, Gentry chaired the UAMS Committee on Clinical Research from 2009 to 2013, and has served on numerous university and institutional committees, including the Dean’s Senior Advisory Council. Gentry has authored or co-authored more than 50 scientific papers and two book chapters. He serves as an oral examiner and previously as an oral exam editor for the American Board of Anesthesiology. He’s also been a reviewer for several publications, including the Journal of Pharmacology and Experimental Therapeutics. Gentry is a lifelong Arkansan. He and his wife of nearly 31 years, Shelley, have two children, Clayton and Sterling.